Alejandro is a 4th year Sociology and Chicano Studies double major, with a minor in Black Studies, at UC Santa Barbara. He is from Coachella, CA, and he hopes to return to his hometown to teach ethnic studies at his former high school. Alejandro grew up influenced by grassroots organizers in Coachella and at a young age began doing social justice work at a nonprofit where he helped host workshops and provide tutoring for the youth in the community. In addition, he has had experience working in grassroots political campaigns by phone-banking and walking streets in order to help elect many of the local officials that represent Coachella today. Aside from doing political and nonprofit work, Alejandro spent most of his time playing sports and appreciating music. 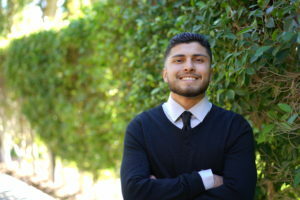 In his first year at UCSB, Alejandro got involved in Hermanos Unidos de UCSB, a Latino-based organization that helps Latinos prosper in their time at the university in which he served as the org’s External Social Chair. He also took part in the National Student Power Summit where he helped lobby bills in Washington D.C. that addressed issues in the education system. In the fall of 2017, Alejandro studied abroad in South America. He studied for six weeks in Buenos Aires, Argentina and six weeks in Santiago, Chile; along with traveling to Uruguay and Peru. At UCSB, his research focuses on juvenile delinquency, specifically observing the relationship between Black and Latino youth with law enforcement and finding ways to break the school-to-prison pipeline. At the same time, he spends time doing critical analyses of Hip Hop music. His biggest inspirations range from Cesar Chavez to Kendrick Lamar.